Fairplay Canada sees its own site blocking proposal as the best option to counter infringing websites. In a reply response to the CRTC, the coalition argues that the 'alternative' judicial option is uncertain, costly, and will take a lot of time. The response further criticizes misleading and false comments from the public, while adding more support for its blocking plans. FairPlay Canada, a coalition of copyright holders and major players in the telco industry, wants to institute a national pirate site blocking scheme. The group submitted its plan to the Canadian telecoms regulator CRTC earlier this year, which subsequently asked the public for input. This consultation triggered a wave of responses. Those opposed to the blocklist idea highlight the risk of over-blocking, net neutrality threats, and the lack of judicial oversight, among other things. Yesterday, the Fairplay Coalition responded to these comments in a new filing. Providing additional evidence, the group countered the opposition head-on, accusing some commenters of spreading false and inaccurate information. The coalition also responded to the common argument that there is no need for a separate blocking scheme. Copyright holders can already request injunctive relief from the courts, demanding that ISPs block pirate sites, as is common in many other countries. In its reply, Fairplay counters that this may not be as straightforward as some claim. Section 36 of the Telecommunications Act suggests that, in addition to a court order, Commission approval is needed to block a site. This is complex and makes it uncertain if courts will be willing to grant these blockades. 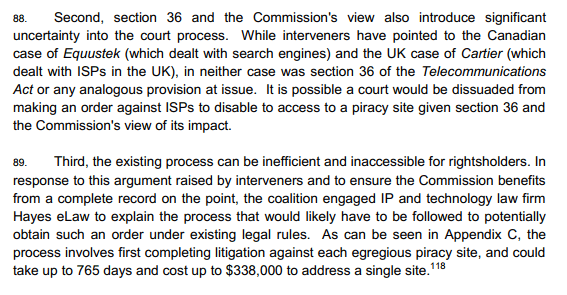 “It is possible a court would be dissuaded from making an order against ISPs to disable to access to a piracy site given section 36 and the Commission’s view of its impact,” Fairplay’s response reads. In other words, the coalition suggests that with proper judicial oversight under current law, there may not be any blockades. It’s not clear how that helps their argument, as that might be the exact point of the critics, but there is more. In addition to the uncertainty of getting a blocking order through the courts, Fairplay argues that this route will also be very expensive. To make this point, the coalition hired the law firm Hayes eLaw to calculate the potential costs and time required to complete the process. According to this analysis, it may take more than two years before a blocking order is final, with hundreds of thousands of dollars in legal expenses for just one site. This is too slow and too expensive, the coalition concludes. “[T]he process involves first completing litigation against each egregious piracy site, and could take up to 765 days and cost up to $338,000 to address a single site,” Fairplay writes. Finally, Fairplay notes that those commenters who suggest the judicial route are apparently not against site blocking, but only against how these blockades are administered. As is often the case with consultations, both sides of the argument will present issues in a light that suits them best. However, Fairplay goes even further and suggests that many consultation responses are based on misleading information, which is the result of online activists. Among other things, these responses suggest that the plan would allow ISPs to unilaterally decide to block websites. However, Fairplay counters that ISPs can only block sites if they’re ordered to do so by the Commission, not on their own accord. “The fact that the Commission received such interventions is not surprising, as every indication is that they were driven by online campaigns that made exactly this false claim,” they write. In addition to the misinformation, Fairplay also notes that some interventions are false, while thousands of petitions are mere duplicates. Fairplay doesn’t ask the CRTC to ignore these submissions. It just points out that they cannot be relied upon, as they are not representative or based on faulty assumptions about the actual proposal. Instead, the coalition comes up with a survey of its own. Fairplay hired Nanos Research to ask random Canadians whether their country should have less, the same, or more protection than countries that currently block piracy sites, such as the United Kingdom, Australia, and France. According to the results, 77% of Canadians believed Canada should have the same or more protection than those countries, suggesting that Canadians are not anti-site-blocking at all. That said, the above mentioned foreign blockades are court sanctioned. The entire response from Fairplay Canada is available here (pdf). It totals more than 60 pages and further addresses the economic impact of piracy, the effectiveness of the plan, how blocking is consistent with net neutrality and freedom of speech, as well as a wide range of other topics. While the extra context will be useful to the CRTC, it’s unlikely to sway the opposition. Around the same time as the coalition submitted its response, a new controversy emerged. Documents published by the Forum for Research and Policy in Communications suggest that Bell discussed the site blocking plan privately with the CRTC before it was made public. While it’s apparent that site blocking was on the agenda, Bell told Mobile Syrup that there’s “nothing procedurally unusual” in this case.